Have you ever met those clients who are resistant to change? Do you have clients that are noncompliant to your recommendations and never complete assigned homework? Or do you find that your work in therapy with one of your clients has stalled and become stagnant? 1) Therapist’s inability to develop rapport with the client. Oftentimes a therapist will assume that client resistance is 100% based on something within the client. In reality, the therapist’s inability to build a strong therapeutic relationship with the client may be a contributing factor. Helping clients feel a sense of relatedness to you. You can do this by trying to match the client’s initial demeanor, disposition, and rhythm. Keeping negative topics neutral—avoid framing statements using negative connotations. Letting clients get to know you—that is, being a real person. Acting interested. Even if you feel bored, step in toward the client and help them feel seen, heard, and important. 2) Therapist imposing their agenda onto client. Therapy needs to be conducted by developing client goals based on collaboration between the client and the therapist. If a client is being resistant or otherwise “noncompliant,” then the issue should be directly and honestly discussed. If a client is not accomplishing certain tasks in therapy, then perhaps these aren’t important to the client and the therapist is simply imposing their own agenda on the client. If a therapist lacks a client-centered approach, then the client will notice (if not consciously, then unconsciously) that their therapist is inflexible or rigid. If a client has issues from childhood resulting from a controlling parent or has problems with authority figures, then they may unconsciously resist what is being perceived as external control from the therapist. 4) Failing to realize that noncompliance is part of the “pathology” that needs to be treated. If goals for therapy have been arrived at collaboratively between therapist and client and there is still noncompliance, then resistance can be addressed as part of what needs to be focused on in treatment. The resistance should be actively discussed with the client, without judgment or surprise. Issues contributing to client resistance may include fears of failure or the fear of terminating therapy. One question a therapist can use to address these types of fears is, “What would happen if you were successful?” or something else along those lines. Always explore topics of resistance with curiosity and encouragement. 5) Need to process fears and early life “schemas” or experiences. A therapist can explore a client’s fears and early life experiences by using the Socratic questioning method. Determine what the client’s underlying beliefs about life are. For example, does the client have a strong need to manipulate others or have power over them? Unmasking and revealing underlying maladaptive schemas, along with addressing their protective factors, should be addressed in the treatment plan. 6) Therapist fears of engagement. A therapist needs to be willing to fully engage with their clients, even if it puts them out of their comfort zone. When a therapist tries to keep the relationship with their clients at a distance because of fears, such as fear of countertransference issues, the clients may sense this distancing. The effectiveness of therapy might then be diminished. A therapist can benefit from taking emotional risks with their clients. Client relationships aren’t so fragile that mistakes can’t be dealt with and overcome. Realizing that no mistake is fatal and that part of good therapy involves the concept of “rupture and repair.” When ruptures in the therapeutic relationship occur, repairing of the relationship can be healing in and of itself. It is always helpful for therapists to realize that everyone has limitations – including therapists and clients. It is important for therapists to understand when they are placing unrealistic expectations on clients based on the therapist’s own experiences. Remember, clients have their own personal experiences that may or may not be conducive to certain treatment outcomes. Examine client’s developmental contributing factor(s) to core problem(s). What does the client want from me or others? What does the client expect from me or others? What is the client’s experience of self in relationship with others? What are the client’s core beliefs? What are recurring themes in the client’s relationships? Establish best therapy interventions to incorporate into treatment. Assess and evaluate effectiveness of current strategies, and make adjustments as necessary. Remind yourself that therapy is supposed to be a fluid enterprise rather than a stagnant one. The best approach to coping with client resistance or noncompliance is for the therapist to look in the mirror. If all efforts at treatment have apparently failed, then the therapist can step back, regroup, and assess the problem(s) in the treatment protocol. 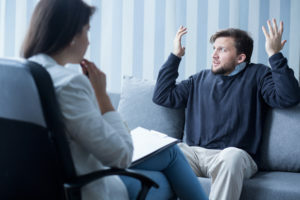 In fact, if the therapist finds themself frustrated with the client’s effort, they may be best-served to “let go” of expectations, as this is a sign that the therapist’s personal agenda is not being met. Realistically, most of the “work” is in the hands of the client in between sessions.The therapist is simply one “tool” in the “tool belt,” and time spent in therapy is limited. Ultimately, the client is the one who is responsible for their own recovery. Lang, E. (2012). A Better Patient Experience Through Better Communication. Journal of Radiology Nursing, 31(4): 114–119. Shapiro, F. (2018). Eye movement desensitization and reprocessing therapy, third edition: Basic principles, protocols, and procedures. New York, NY: The Guilford Press. Teybor, E., McClure, F. H. (2011). Interpersonal process in therapy: An integrative model. Belmont, CA: Cengage Learning.